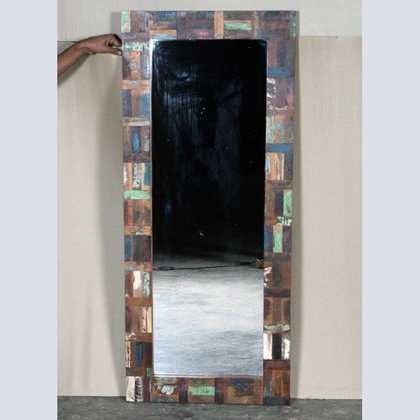 A colouful full length tall mirror with sections of mirror. 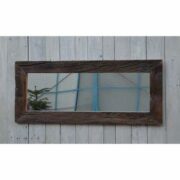 This unusual full length mirror is very unique to our collection, a one off. 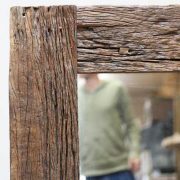 It is tall and narrow and has three sections for mirrors seperated by a strip of wood. The mirror frame has various colours changing from top to bottom; from blue to green, to white and then orange. 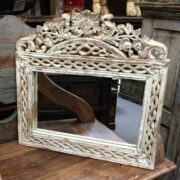 The frame is also decorated with delicate flower metal studs, brass coloured.